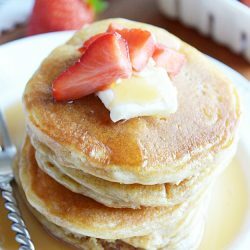 Fluffy buttermilk pancakes from scratch that are so easy to make, you’ll never be tempted to buy a mix again! If you’re one of my super regular readers (hi Mom), you maaaaaaaaaaaaybe noticed that this post is going up at a different time than usual. And that I didn’t post anything at all yesterday! What the what?? In an ever ongoing effort to (somewhat gracefully) manage this life that is all about being called MOM, I’m changing around my posting schedule. Instead of posting five evenings in a row (whew! ), I’m switching to three mornings a week of just recipes. Which means I’m cutting way down on recipe collections (although I’ll still post those every once in a while) and moving my personal posts to the weekend. So the actual number of recipes posted each week won’t change, I’m just cutting down on the clutter in between. 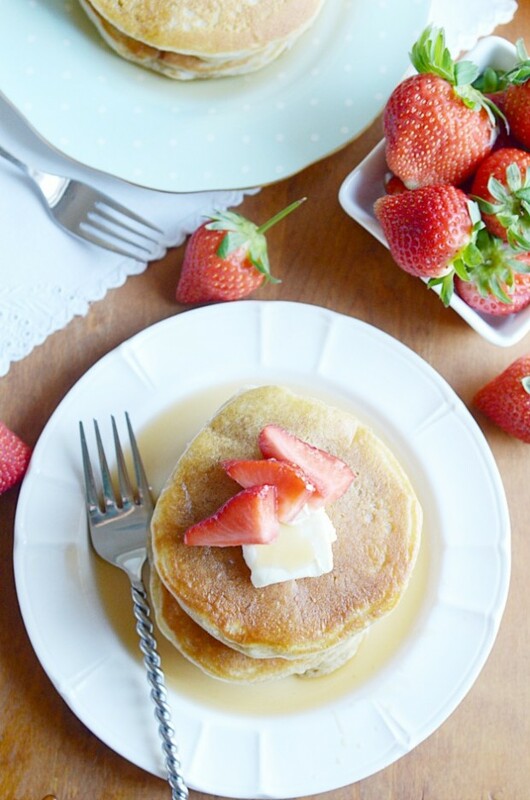 Speaking of recipes… is there anything better than a perfect buttermilk pancake recipe? The answer is, of course, no. Because NOTHING is better than buttermilk pancakes. I used to wake up at 5:00in the morning in high school just to make myself a big pancake breakfast before I had to leave for my early morning class. And it never ever bothered me. Because freshly made pancakes were totallllllllly worth it. I’d get to class and my friends would be nibbling on a poptart or saying something about how they just aren’t that hungry in the mornings, blah, blah, blah. I’d nod along and agree and pretend that I wasn’t a pancake addict psycho who needed to wake up at the crack of dawn to get her fix. Truthfully, not much has changed. I’ll still do whatever it takes to get my pancake breakfast in a couple of times a week at least. And, of course, my 5-year-old doesn’t mind. We take our breakfast carbs verrrrrrry seriously around here ????. 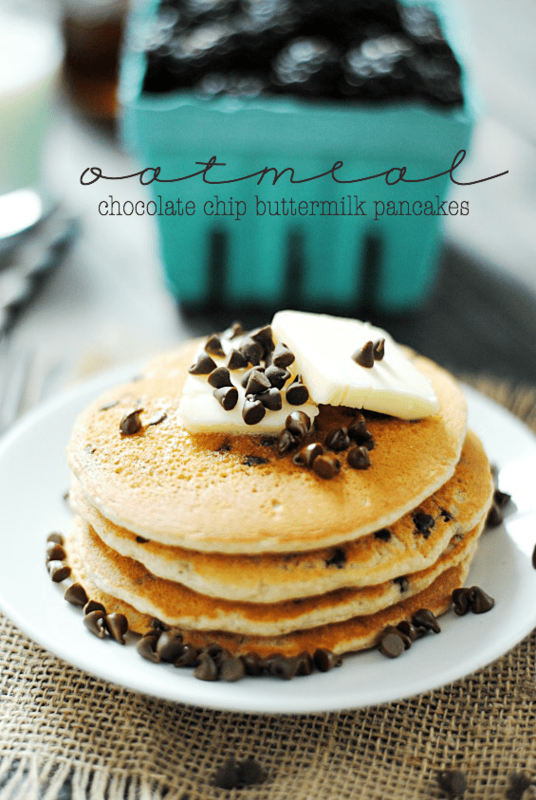 This is my favorite pancake recipe to date! 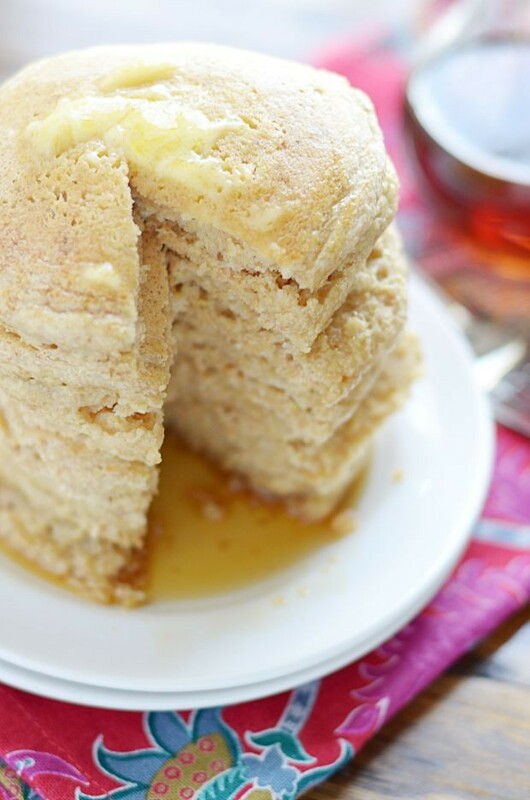 It makes incredible soft and fluffy pancakes with minimal effort. The most important thing to remember is to use REAL buttermilk (not the milk + vinegar substitute). As long as you use real buttermilk, you’ll get beautifully fluffy and thick pancakes every time. What’s your favorite thing to put on pancakes? Tell me on Instagram! 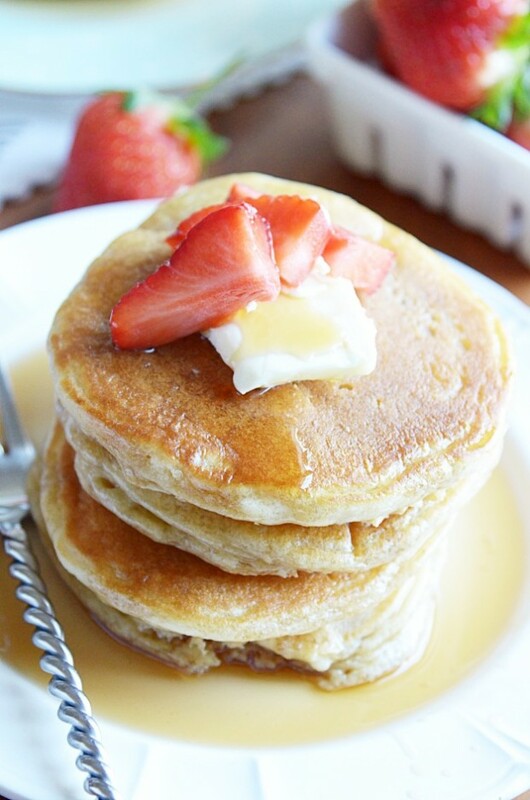 Fluffy buttermilk pancakes from scratch that are so easy to make, you'll never be tempted to buy a mix again! Preheat a griddle to 350ºF. Mix together the flour, sugar, baking powder, baking soda, and salt. Set aside. In another bowl, whisk together the eggs, oil, buttermilk, vanilla, and lemon juice. Pour the wet ingredients into the dry ingredients, and whisk just until batter forms (there will still be some lumps). Pour 1/4 cup of batter on to the buttered griddle for each pancake. Let cook for about one minute, until the edges start to look try and pocks form on the top. Flip and cook on the other side for about a minute. 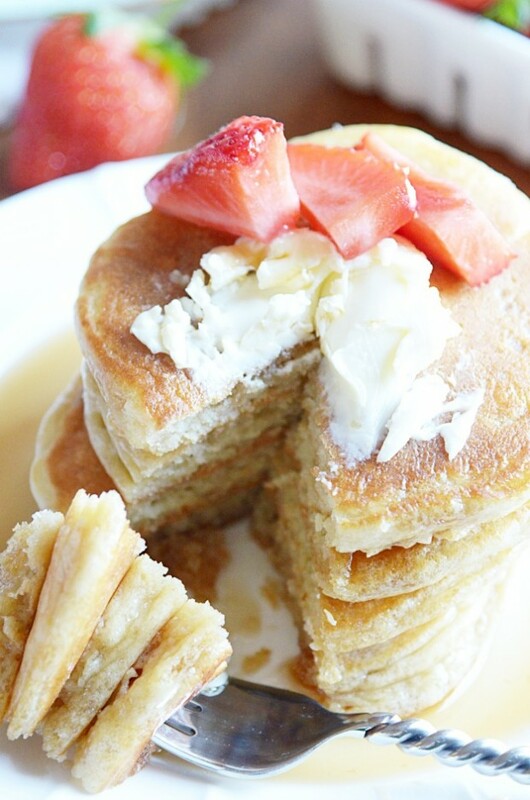 Serve warm with maple syrup, strawberries, and butter! Try my Whole Wheat version next! Here’s my Buttermilk Oatmeal Pancakes. They melt in your mouth!